For the media and soccer executive, see Mark Shapiro (media executive). 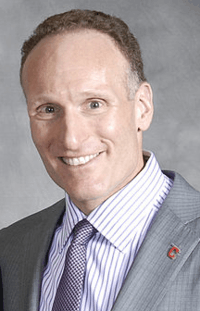 Mark Shapiro (/ˈmɑːrk ʃəˈpaɪroʊ/; born 1967) is an American professional baseball executive, currently working as the president and CEO of the Toronto Blue Jays of Major League Baseball (MLB). He previously worked with the Cleveland Indians from 1991 to 2015, beginning in player development and ending as team president. Shapiro worked in the Cleveland Indians organization since 1991 when he was recommended by former Tribe GM Hank Peters. He had worked his way up from player development director to assistant general manager, and in 2001 became general manager. Shapiro was named Executive of the Year by the Sporting News in 2005 and 2007, following 90+ wins seasons by the Indians, including an American League Central Division Championship in 2007. At the end of the 2010 season, he became the Cleveland Indians team president, with Chris Antonetti succeeding Shapiro as general manager. On August 31, 2015, The Toronto Blue Jays announced that Shapiro would become their new president and chief executive officer (CEO) at the end of the 2015 season, succeeding Paul Beeston. Shapiro did not formally begin working in the new role until October 31, 2015, the same day that Beeston retired. In a press conference on November 2, Shapiro named Tony LaCava the interim general manager, to replace Alex Anthopoulos. Subsequently, on December 3, 2015, Ross Atkins was named as the team's sixth general manager, under Mark Shapiro. Shapiro was born to a Jewish family, the son of Baltimore attorney and sports agent, Ronald M. Shapiro, and the brother-in-law of former Cleveland Browns coach Eric Mangini. He graduated from the Gilman School in 1985 and Princeton University in 1989 with a degree in history. Shapiro married Norwalk, Ohio native Lissa Bockrath in January 2001. They have one son, Caden, and one daughter, Sierra. Bockrath-Shapiro is a 1995 graduate of The Cleveland Institute of Art, and owns an art gallery called Bockrath Gallery. They lived in Bentleyville, Ohio while Shapiro worked for the Indians. Shapiro was played by actor Reed Diamond in the 2011 film Moneyball. Honorary Doctor of Letters from Baldwin Wallace University (2014). ↑ "Indians executive Mark Shapiro to become Blue Jays president: reports". theglobeandmail.com. August 30, 2015. Retrieved November 2, 2015. ↑ "Executive of the Year Award by The Sporting News". Baseball Almanac. Retrieved July 22, 2015. ↑ "AL Central Division". Baseball-Reference.com. Retrieved July 22, 2015. ↑ Castrovince, Anthony (February 18, 2010). "Shapiro, Antonetti to step up after 2010". MLB.com. Retrieved February 20, 2010. ↑ "Antonetti to GM among Indians' promotions". Major League Baseball. Retrieved August 31, 2015. ↑ MacLeod, Robert (August 31, 2015). "Blue Jays name Mark Shapiro as next president and CEO". theglobeandmail.com. Retrieved November 2, 2015. ↑ Chisholm, Gregor (August 31, 2015). "Shapiro to become Blue Jays president, CEO". MLB.com. Retrieved August 31, 2015. ↑ Simmons, Steve (October 31, 2015). "Simmons Says: With Anthopoulos gone, Shapiro's takeover of Blue Jays complete". torontosun.com. Retrieved November 2, 2015. ↑ Rumley, Jonathan (November 1, 2015). "Mark Shapiro takes over as Blue Jays president/CEO and CEO". cbc.ca. Retrieved November 2, 2015. ↑ Nicholson-Smith, Ben (November 2, 2015). "Blue Jays name Tony LaCava interim general manager". Sportsnet. Retrieved November 2, 2015. ↑ Davidi, Shi (December 3, 2015). "Blue Jays to name Ross Atkins as team's new general manager". Sportsnet. Rogers Digital Media. Retrieved December 3, 2015. ↑ "Account Management - Login/Register" (PDF). Major League Baseball. Retrieved August 31, 2015. ↑ "Don't Hate Mark Shapiro". clevelandmagazine.com. April 2002. Retrieved November 2, 2015. ↑ "Cleveland Indians Report". cir.blogspot.com. Retrieved August 31, 2015. ↑ Meisel, Zack (October 4, 2015). "Cleveland Indians honor outgoing president Mark Shapiro, who catches ceremonial first pitches". cleveland.com. Retrieved November 2, 2015. ↑ The Cleveland Institute of Art (January 23, 2004). "The Cleveland Institute of Art Sponsors 24th Annual Regional Scholastics Art Awards Exhibition". prnewswire.com. Retrieved August 31, 2015. ↑ "Urban Land Institute". Urban Land Institute. Retrieved August 31, 2015. ↑ Bastain, Jordan. "Shapiro shares his thoughts on 'Moneyball'". MLB.com. Retrieved November 3, 2015. Ruttman, Larry (2013). "Ronald Shapiro and Mark Shapiro: Father and Son, the Merging of Judaism into America". American Jews and America's Game: Voices of a Growing Legacy in Baseball. Lincoln, Nebraska and London, England: University of Nebraska Press. pp. 223–239. ISBN 978-0-8032-6475-5.